Index futures were getting savaged late Monday night as DaBoyz worked feverishly to exhaust sellers so that they can run stocks up the ol’ wazoo ahead of the opening bell. This is a dangerous game, even for the thimble riggers who control America’s securities exchanges. I’d flagged the 2533.50 downside target shown (click thumbnail inset) for the E-Mini S&Ps less than an hour ago, when it looked like it would take the whole night to get there. If it has been exceeded by the time you read this, shift your sights downward to 2499.25, and thence to 2467.50. 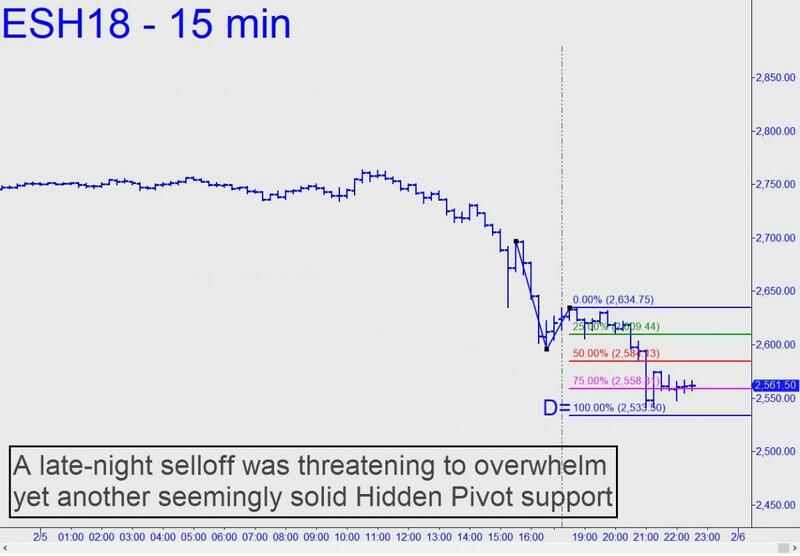 As always, the more easily each successive Hidden Pivot target gives way, the more likely the next is to be reached. Is this the start of the Big One? Speaking as an inveterate permabear, my answer is no. I believe the selloff is merely corrective but that it won’t end until permabulls start showing signs of real fear. This has yet to occur as far as I can surmise, and it could conceivably take climactic selling far nastier than what has occurred thus far to bring them around.